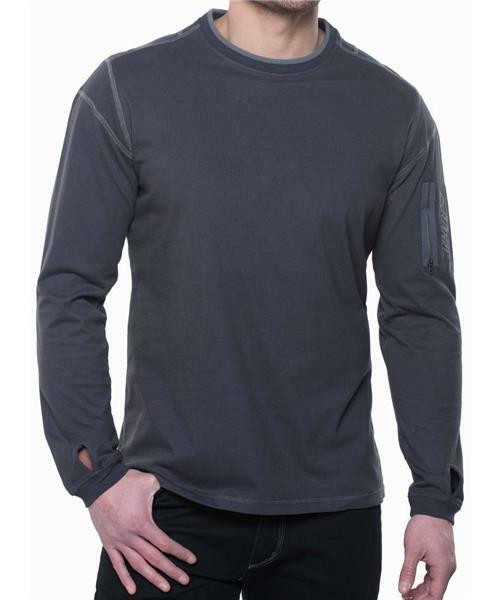 The KÜHL Kommando™ Crew features rugged styling and 100% combed and peached Organic Cotton for soft, strong 'on command' performance on any mission. Flatlock seams deliver next-to-skin comfort, reduced bulk, and strength. An upper sleeve pocket with reliable Riri zipper provides secure storage. The Kommando Crew features KÜHL's signature thumb loops. River wash provides an authentic look. Note: Machine wash with mild detergent and warm water for best care. Kommando Crew - Mens is rated 5.0 out of 5 by 1. Rated 5 out of 5 by Nomad photographer from Love it I want more colors .comfortable !!!!!!!!!!!!!!!!! !